Japan's March Tertiary Industry Index foreseen down by 0.2% vs. the previous advance of 0.4%. Bulls in pause ahead of next catalyst bears side-lined. The USD/JPY pair spent Monday hovering around the 112.00 figure, unchanged from Friday's close. The pair lost some ground at the beginning of the day, bottoming at 111.88, as US government bond yields ticked modestly lower at the beginning of the day, ending it little changed in a dull start to the week. Japan didn't release any relevant data at the beginning of the day, although the country will release the March Tertiary Industry Index during the upcoming session, foreseen down by 0.2% vs. the previous advance of 0.4%. Market players will be looking at Chinese data, as despite the country is expected to release minor figures, risk appetite could easily resume on upbeat figures. 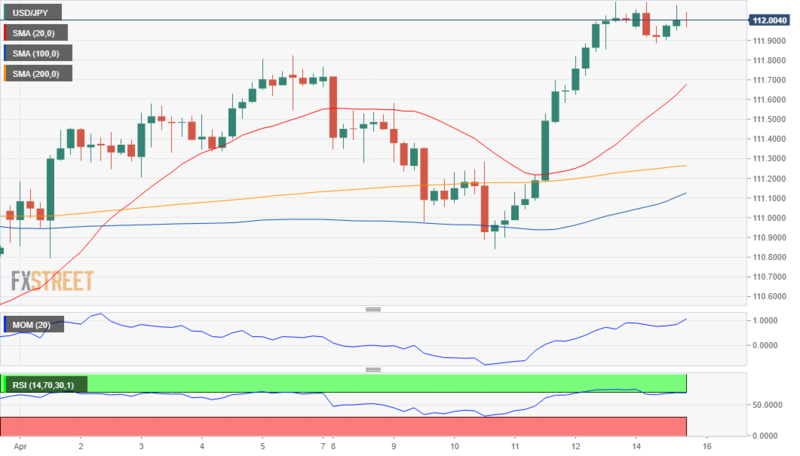 The short-term positive momentum eased, but the risk remains skewed to the upside according to readings in the 4 hours chart, as indicators barely retreating from overbought levels, the Momentum heading south and the RSI now flat at around 67, while the price continues developing well above its moving averages. The 20 SMA maintains its strong bullish slope above the larger ones, indicating that bulls retain the control. A downward corrective movement, however, is possible on a break below 111.80, the immediate support, while bulls could take over if the price surpasses 112.13, the yearly high.